of course – their lives. Mike is an authentic character, and I’m sure many kids will identify with him although he doesn’t own a smartphone or TV. The plot is thrilling and exciting, you can’t put it down until the very last page. 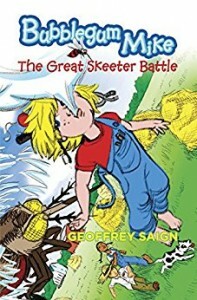 However, I think that young kids might find the skeeters quite intimidating so I wouldn’t recommend this for children under 8 years old.